In this post are the guidelines on how to setup custom robots headers tags in blogger blogs. One of the most important and non-negligible parts of blogging is optimizing your site for search engines, known as Search Engine Optimization (SEO). While we have off-page SEO, we also have On page SEO where adding Custom Robot Header tags in blogger is one of the on-page optimization techniques or strategy. Since the Custom Robots Header Tags feature was introduced by blogger developers, it has been a tool which helps to select which portion of a blog should be indexed and which should be protected from being indexed in search engine results. The Custom Robots Header Tags is just like including a search description in blogger. It plays a great role in a blog’s Search Engine Optimization by improving its rank in search engine results. An improvement in a blog's rank means more clicks to its pages and traffic, hence more income and domain popularity. What Do Custom Robots Header Tags Do? These Custom robots header tags allow you to tell web crawlers not to index certain parts of your site. It is similar to Custom Robots.txt file in that they tell search engines what to do, and are both beneficial for getting traffic from search engines and improve a blog's visibility in search engine results. As both names imply Robots, you are working with data search engine bots like Google bots will handle and what they should do while on your blog. On the other hand, while they have the same purpose, they work differently. This is because to set Custom Robots Header Tags in Blogger we tick the sections to be crawled while in Custom Robots.txt file we have to write commands in Blogger's search settings or Google Webmaster console. 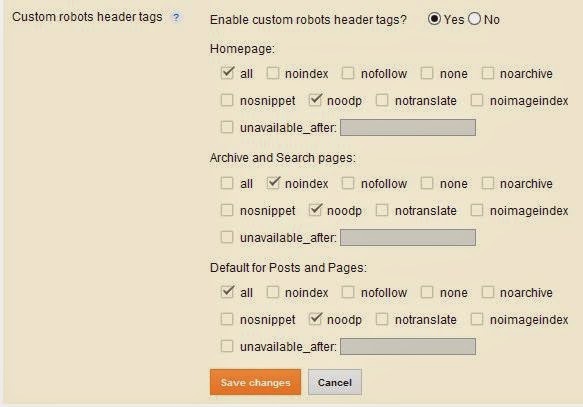 To implement custom robot header tags in your bog, follow the steps below on how you can add custom robots header tags settings in your blogger blog. These are the steps that will help you set up custom robot header tags in blogger. Ensure you follow it with care in order not to make mistakes that may impact negatively on your site in search engines. Click on 'Edit' option for custom robots header tags and tick 'Yes' to enable It. A dialog box as shown below will come up. Mark the appropriate fields as with the image. Click on 'Save Changes' and you've just added custom robots header tags to your blogger blog. The meaning of Custom Robots Header Tags fields ticked in the image above are given below. 1. ALL: This attribute means no restriction for indexing because it always defaults for all pages. It will crawl and index all the contents of the page. 3. Nofollow: This attribute indicates and tells the crawler robot not to pass any link juice to any links on this page. 5. Noarchive: This attribute means: not to show "cached" links in a search result. 7. Notranslate: This attribute means: not to show translation option in others language in a search result for this page. 8. Noimageindex: This attribute means: not to index images in a search result for this page. 9. Unavailable_after: This attribute orders the search robot not to show this page in search results after specified date/time. As custom robots txt file is important in search engine optimization, so is custom robots header tags. If you had problems implementing these steps outlined above for the custom robots header tags settings in blogger, let us know by commenting below, and we'll be glad to help you out.